Hi All - a bit of an anticlimax after last week's anniversary excitement. It's been half term holiday for schools here, so DH was home for a week, which meant I didn't get to spend much time at my desk. He did take me for a trip one afternoon, to Hobbycraft, where I spent a birthday gift voucher (plus a teensy bit more!!) So this is how my desk looks tonight. I can't wait to try out all the new lovelies. On the WOYWW anniversary front, I've just finished the last three ATCs (last minute arrangements) and will stick them in the post tomorrow. Thanks to everyone who sent me one - I'll post pics next Wed, plus how I end up storing them. There really are some talented, generous crafters out there! I hope to catch you all over at Julia's party time. 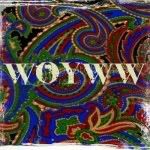 If you don't know about this, click the WOYWW button on my side bar - careful, it's addictive!! Love for now, and have a great week. The ATC swap has been fun, hasn't it?! 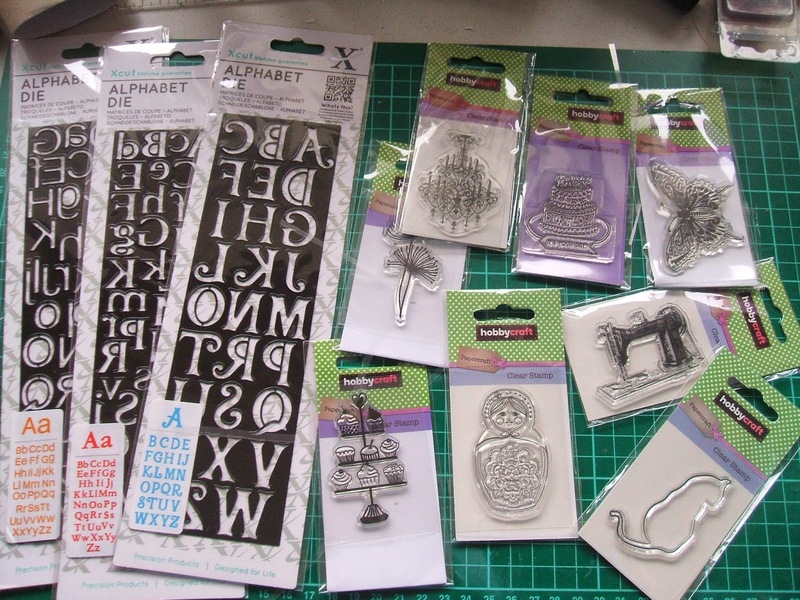 You had a lovely time in Hobbycraft...those letter stamps look great. Can't wait to see what you make with them! A nice stash of new goodies there! Your ATC went postal today. Hope it doesn't take too long to get there. Have a good week! What a Birthday haul GF! I, too, notice the Russian doll right away! They all look fun. ooh all your new stash looks fab! The stamps look good you should have fun with those. Great birthday goodies! I really like the cat stamp. Happy WOYWW! It looks like you had a blast at the hobby shop with your birthday gift card. I like everything you got, especially those font die cuts. Blessings! Hmm, I'll need to check for alphabet dies -- those are very cool. I can tell you had a great time spending your gift certificate (and what is it about always finding too much?!?). Thanks for your visit already. I'm hoping to at least get most of my visiting done today and tomorrow! A trip to Hobbycraft to spend a gift voucher sounds wonderful! And yes, it would be hard not to spend more than the voucher! You can't beat new stash:) Enjoy playing. Hello! Oooooo love the chandelier stamp! Great find there, I am always looking for them and they are hard to find here. Your ATC will be mailed out Monday. Love the pics of your Kitty, so pretty! Thanks for visiting me! I don't know about Hobbycraft if it sells supplies then I would love to go but they aren't here in Australia. You have a wonderful collection of supplies, have fun using them. Sorry I am getting around the desks really late this week, not normally me. We have had a long weekend here for the queens birthday and opening of the ski season, we are now in winter. Hello Chris. I love that chandelier stamp and the seedhead - gorgeous. Those alphabet dies are great, too. Incredibly useful!! Thanks for visiting this week, and HUGE apologies for taking all week to get back to folk! Thanks for your prayers. John is still far from well, and the GP has even called in on his day off today!! However, he feels John is improving, and trusts that the next set of bloods will show that fact. It seems to have gone on for a LONG time. But, I know that Father God is caring for us in it all, I seeHis hand in so much around me.